Last week I escorted a group for a day trip over the Valensole plateau. It’s a tour that I don’t do often enough with tourists, as the majority want to stay on the western side of Provence in the Luberon valley, and so it remains for me more often a family outing. The mention of the Valensole plateau immediately conjures up images of endless lavender fields in summer, and that is indeed what you find there. 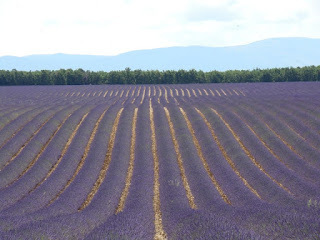 Although the disease spread by a relative of the cicada* has decimated the lavender in the past years, new fields are being planted, and the surviving ones are still as impressive. The main variety grown up here is Lavandin (Lavandula x hybrida) whose essential oils are used in the manufacture of industrial products; washing powders, air fresheners etc. For fields of True Lavender (Lavandula angustifolia) used in cosmetics and herbal remedies you have to climb above 800 metres to the Plateau de Sault (article coming soon). But back to Valensole. The other thing you can’t help noticing as you drive across the plateau - aside from coach loads of tourists wading through the rows of lavender, taking photos and picking bouquets of it as a souvenir – are the Almond trees. Once a major cash crop in Provence, cheaper competition brought the production to a near halt, and most of the trees you see now are lone wild ones, or remnants of a bygone age. However in recent years there has been a rise in demand for high quality almond oil especially from L’Occitane en Provence who has been essential in the renaissance of this emblematic tree. One of the biggest producers on the plateau is Jean-Pierre Jaubert who is the main supplier for L’Occitane, and wandering around his farm with a handful of delicious almonds (he eats two for my every one!) as he tells you the cycle of his crop and the process of shucking, and shows you the huge cold rooms used for storage to preserve the creamy white almonds (another handful is lifted here to continue our visit) you feel privileged to be with a man who’s passion for his work is contagious. 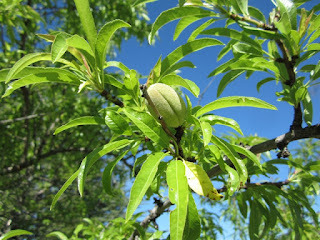 I visited in March when the flowers are blossoming and to stand immobile in the middle of the trees all you can hear are the bees, and as you listen it seems to get louder and louder to a point of it being almost deafening, in fact being the only sound you can hear, it has a strange hypnotic effect. The lavender fields of Valensole produce the same humming noise, but in July it is also combined with the clicking of cameras, the cries of delight in 20 different languages and thus loses some of its hypnotic qualities. 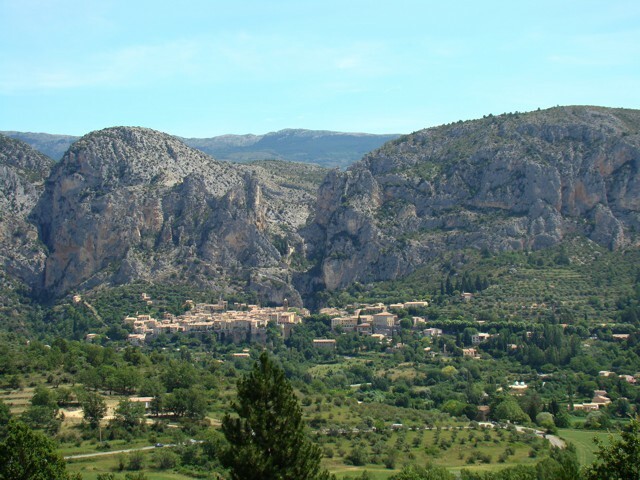 We continue across the Plateau with our next destination being Moustiers Ste Marie. This picture postcard town set against the rocks, which if you follow to the right, will lead you into the Verdon Gorges (another article coming on these too) is dominated by a star hung between two rock ledges on a huge chain. The original star was hung by the Blacasset, a soldier and troubadour who vowed that if he returned to Provence after his capture during the seventh crusade he would erect a shrine to the Virgin Mary. This he did in the form of a 16 pointed star, emblem of the family, hung on a chain over the village of Moustiers which today 800 years on and after a few falls and restorations still hangs proud, but with only 5 stars now. 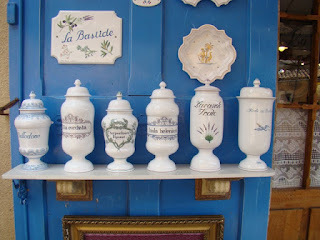 Moustiers is also famed for its pottery or Faience and the town is dotted with shops offering their beautiful creations, with the unique blue/white glaze typical to the town. Moustiers is a town where you can spend quite some time wandering the narrow streets, and for the fitter amongst you, a climb up to the chapel of Notre-Dame-de-Beauvoir offers a splendid view over the rooftops of Moustiers Ste Marie. 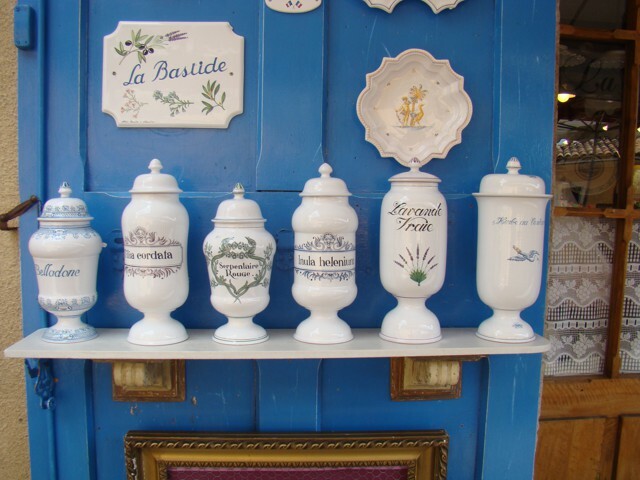 Friday is market day and so arriving in the morning and purchasing the making of a Provençale picnic during your meanderings and then driving the short distance down to the Lac de Ste Croix is a perfect program. Alternatively you could book the ultimate picnic experience at Alain Ducasse’s Bastide de Moustiers,with his picnic in the 1950’s Chevy. For the continuation of this article let’s go with the simpler picnic by the lake. The Lac de Ste Croix is the fourth largest man-made lake in France covering 2200 hectares. It was filled in 1973, submerging the village of Les Salles sur Verdon (a new one was later built on the banks of the lake). At one end of the lake is the entrance to the Verdon Gorges and it is the Verdon River that feeds the lake, at the other end on the other side of the Dam are the smaller Gorges du Baudinard which are a delight to canoe up on a hot summer day. 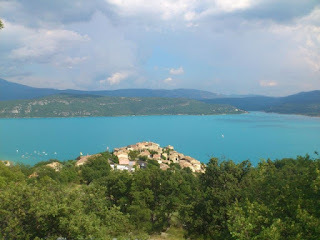 Heading down to the village of Ste Croix du Verdon, when you first see the lake it is the turquoise blue colour of the water that catches the eye, this incredible hue is due to the beige coloured stone on the lakes bottom, which makes the crystal clear water of the Verdon blue with the refraction of the sunlight. You can get into the holiday swing of things by renting a pedalo or an electric boat (no engines on the lake) or a Hobie Cat when the wind picks up in the afternoon. Following the path along the lake side there are plenty of shady spots away from the crowds to picnic and swim, but beware, even though the water close to the banks and on the surface is warm, it is very cold just below. There is no sand to speak of but medium sized pebbles so some form of waterproof footwear is a good idea. Also it is strictly forbidden to light any form of fire, and if you try, the park wardens will be there in minutes! The lake is regularly used by the Canadairs, the famous French airborne fire fighting team, and watching the planes pick up water on the lake is a very impressive sight indeed. 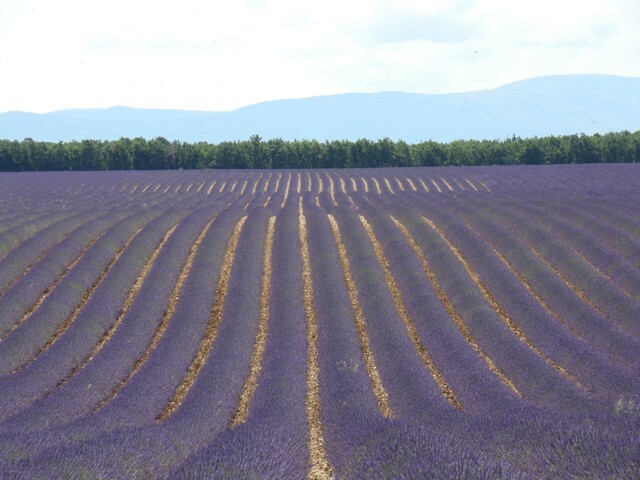 If you would like to know more about touring the Valensole plateau and beyond (only a tiny bit of the treasures of this region have been covered in this article) then use the contact form here, and it would be with great pleasure that we can help you plan a trip to this magical part of Provence.